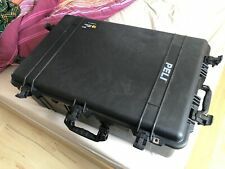 Used but in great condition Peli 1650 case. The Peli 1650 case is equipped with 5 cm hard rubber transport wheels, a retractable extension handle and multiple fold down carrying handles. It is NATO codified and tested to MIL C-4150J (Military Standard), IP-66 (Ingress Protection) and ATA (Air Transportation Association). Peli Case 1650 Protective Plastic Travel Case Military Airsoft. Condition is Used. Collection in person only. Peli Protector 1650 Case. In excellent condition, with only light signs of wear. All the catches are nice and tight, and the handles are all good. There are minor surface marks here and there, but it looks very lightly used overall. Protective Cases are specialist suppliers in the whole range of Peli Cases and Peli Torches. FOR SALE : 4 PIECE PELI FOAM SET FOR 1650 CASE. The dividers are made from ballistic nylon and are padded and flexible. PELI™ Padded dividers for the Peli 1650. (CASE NOT INCLUDED). Protective Cases are specialist suppliers in the whole range of Peli Cases and Peli Torches. Incorporated into the shell of the case is a pressure purge valve to allow pressure equalisation. A neoprene "O" ring in the lid ensures that the tongue and groove seal remains watertight. The hinges and handle interlocks form an integral part of the moulding, making it virtually impossible to break in the event of rough handling. New peli case. Bought and put into storage but never used. Waterproof and dust proof. Lid Depth (C) (mm): 45. Lid Width (B) (mm): 460. Lid Length (A) (mm): 740. Total Depth (C) (mm): 265. Total Width (B) (mm): 460. TrekPak 1650 for Peli™ 1650 Case get the best protection possible inside your Peli 1650 case with the TrekPak custom insert. The TrekPak insert allows you to optimize space while maximizing protection. Ending Soon. we do not take any responsibilty after this. you can buy in set of 6 max. Desktop PC. PC Components. Monitor & TV. Why Choose Us! With approx. Also Computer Towers and other electronic stuff. Equipped with extractable, folding handle and special rollers. Side handles for even better handling. Optional 4 piece foam insert. We will do our best to turn any less than satisfactory experience into a positive one. Your valuable electronics need protection, especially when you're going outdoors or moving them from one location to another. The Peli 1650 case can provide your devices with adequate protection. The cases can be configured to store camcorders, cameras, and various other accessories. eBay has a range of Peli products in a variety of colours, including black, desert tan, olive-green, and orange. What kinds of configurations are available for the Peli 1650 case? The are three main types of configurations available: with foam, without foam, and with dividers. Each style is designed to provide different levels of protection and versatility. Without Foam: These cases are empty and come without a preset configuration inside. 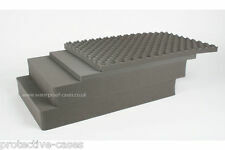 They are suited for those who want a custom-made interior padding set or have very unique items. You can also buy extra foam if you need more padding. With Foam: Foam cases can help absorb shocks in order to protect your electronics. You can cut out cavities to fit your electronics inside the case. Padded Dividers: These cases provide protection for your accessories while leaving space for other items. You can also find cases with dividers if you need extra space for your devices. What features does the Peli 1650 case offer? Waterproof and dustproof: The gap between the body and lid is sealed with an O-ring to provide protection from water and dust. Crushproof: Solid walls and reinforced grids help cases resist strong external pressure. They also have open-cell cores which provide extra padding for your gear. Rubberised handles: Sturdy and comfortable handles enable you to easily carry your gear for extended periods of time. What are the measurements of the Peli 1650 case? The exterior measurements of the Peli 1650 are 80 cm x 52 cm x 31 cm. The interior measurements are 74 cm x 46 cm x 26.5 cm, which means there is plenty of secure space for storage. The lid is 4.7-cm deep, so you can easily store cables, memory cards, and other small accessories with the right setup. See the manufacturer site for details. Content provided for informational purposes only. eBay is not affiliated with or endorsed by Peli.